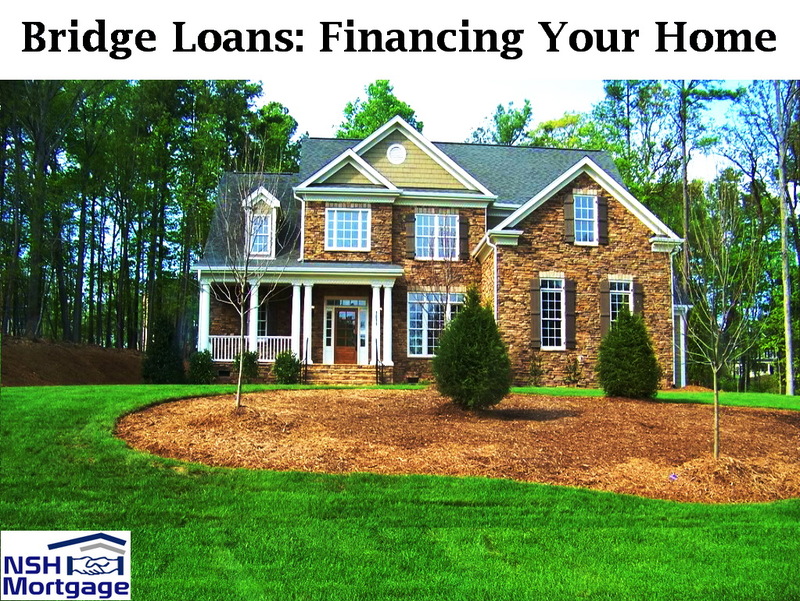 Bridge Loans Financing Your Home. NSH Mortgage has the knowledge and tools to help you see if a bridge loan is right for your current situation. Bridge loans are temporary mortgages that provides a down payment for any new home before you are able to complete the sale of your current home. Many buyers today would like to sell their current home to provide a down payment on the next one. But timing can also be considered a problem since you cannot always make this happen. Sales can often fall through on the perfect home for you, since it has many offers and has a seller who also wants to close it fast so you better act fast before you lose the chance to buy this home. With the bridge loan it is considered an effective tool when buying a new home before selling your current one. There are two ways a bridge loan can be structured. The first method is to pay off your current mortgage, and to provide additional funds for your new home’s down payment. For example, your old mortgage is $200,000, you need $50,000 for your new home down payment, and your current property is worth $500,000. You might take a bridge loan and pay it off with the profits from your previous home sale. Your bridge loan does not usually require monthly payments. Instead, the interest is added to your loan balance. This is a great benefit if your income is not sufficient to pay two mortgages at once. However, there is a downside to bridge loans it is the fact that they are very expensive. They come with much higher fees, and interest rates of about two percent above comparable prime mortgage rates. That makes sense when you think about it. The lender needs to make money on the loan, even though the loan’s lifespan is only a matter of months. So expect higher borrowing costs. The second scenario is more like a home equity loan. Instead of replacing the existing mortgage on your old home, you can take a smaller bridge loan that just covers the $50,000 down payment on the new property. Once you sell your old home, you pay off your old $200,000 mortgage, plus the $50,000 bridge loan (and accrued interest) from the earnings. It is a lower cost option, however, you must be able to continue to pay off your old mortgage and also continue to make payments on your new property. How does the existence of a bridge loan affect you from qualifying for a new mortgage? Typically, the bridge loan cannot be secured in any way by the new home (this is called cross-collateralization). In other words, the loan has to be attached to the property you are exiting. If you have an unsold house and a bridge loan, Fannie Mae simply requires your lender to document the borrower’s ability to carry successfully the payments for the new home, the current home, the bridge loan, and other obligations. Fannie Mae will not require the old home’s payment to be counted against you in the qualification process. However, the former property must be in escrow and you will submit to the lender the following items. If possible, provide adequate documentation so the lender can disregard the payment on the former home. What If The House Does Not Sell? Bridge loans are designed to be paid off quickly, with normal terms ranging from six to 12 months. If you do not sell your home in time to repay the bridge loan, your program may allow an extension. However, if your lender does not grant it, or if you get an extension and still cannot sell your property, the lender may foreclose. That is also a pretty risky venture in some markets so it is smarter to look into some cheaper and safer options. There are other ways to finance a new home purchase before the old one sells. They come with advantages and disadvantages in comparison to bridge loans. You might be wondering why you cannot take out a home equity loan against your current property, use it for your down payment, and pay it off when the house sells. Most lenders will not approve a loan secured by property that is listed for sale. That fact will almost certainly be noted on the appraisal. Home equity loans are meant to be kept for years, not months. Lenders do not want to spend time and money opening a line of credit that will be paid off months later. However, you might be able to borrow against your home equity before putting your home on the market. Plan ahead if you are considering a move in the next year. Save the home equity profits somewhere safe while house hunting, and you will have your down payment when you need it. Make sure the home equity loan does not jeopardize your new home purchase. The home equity payment will be included in your debt to income ratio (DTI) when you apply for your new home mortgage. Your qualifying income will have to support three loans: the old mortgage, the home equity loan, and the new mortgage. So be wise and plan accordingly. If your home will not sell quickly, refinance it before you put it on the market. Get a loan with the lowest interest rate such as a three year ARM. Request a large enough loan amount. Your loan amount should be enough to pay off your current loan, pull cash out for the down payment on the next house, and make several months of mortgage payments. So what is Cash Out Refinance and what other alternatives are available to you. It is not exactly like having a bridge loan with no payments, but it is less expensive and gets the job finished. The lender for your new house will consider both payments when underwriting your loan. Your income will still have to support both payments. If your credit is good enough, you may be able to borrow your down payment with a personal loan, and repay it when your old home sells. The costs are generally low, although interest rates for unsecured personal loans are considerably higher than mortgage rates. You will still be making payments on three loans until your home sells, however. A loan against your 401(k) is an option if your employer allows it. It will not affect qualifying for your new mortgage because payments are not required (in effect, you are borrowing from yourself). If you can repay it (usually within 60 days), you will not likely incur tax penalties. However, if you do not get it repaid in time, the amount is taxed as ordinary income, and you will be subject to a ten percent penalty. Another strategy is to reduce the required down payment on the new home, thereby eliminating the need for a bridge. That can be done with a piggyback mortgage on the new home, a first and second mortgage combination. Piggybacks come in several guises; a 80-10-10, for instance, provides a 80 percent first and a ten percent second, then you make a ten percent down payment. A 80-15-5 requires just five percent down. A 80-20 requires no down payment, although those are nearly non-existent in today’s market. When you sell the old home, you just pay off the second mortgage on the new property. You are left with a first mortgage only, at a low fixed rate. Other options for your new home purchase includes USDA home loans or VA mortgages, which require no down payment. Conventional loans go up to 97 percent financing. These low down payment loans, however, often come with restrictions about the buyer’s current property ownership. Typically, the buyer cannot own adequate housing in the same region, even if there is legitimate reason to move. The main drawback for all these methods are that you will still be paying for two or more loans until the old house sells. The biggest advantage of a bridge loan is that it can allow you to buy a new home without obligating yourself to two mortgage payments at once. If you can swing both payments, there are cheaper, less risky methods of financing your purchase.